I spent Passover’s first half in Israel. The day of the Seder, I traveled by bus to Jerusalem’s Malcha Mall with my oldest niece. She was meeting a friend, and I was on the hunt for comfortable shoes. At the entrance we went our separate ways. While I failed to find footwear, I wandered around, absorbing the scene. Women sat shoulder to shoulder in a manicure salon, set up in the middle of the first floor. I inquired about the price (about $10 for a quickie) and was told that they were too busy to accommodate another customer. Despite several levels of gleaming retail stores, impromptu vendors sold seasonal wares from tables, mostly cakes and other baked goods that were, despite their normal appearance, kosher for Passover. In Israel, it’s possible to buy a wide range of rolls, bagels and desserts created with potato and other non-wheat flours. Restaurants, in a daunting logistical feat, transform themselves into kosher for Passover eateries. One evening the family dined at a kosher Italian place where I ordered faux fettuccine with artichokes and spinach; my nieces and nephews ate “pizza”. They even offered several choices of dessert. All the dishes looked as they otherwise would, even if the taste and somewhat rubbery texture gave them away. While I don’t begrudge the Israelis their ingenuity with potato flour, or their entrepreneurial savvy in reinventing menus for one week each year, the prevalence of kosher food makes the holiday seem more like an all you can eat buffet than a commemoration of the Jews’ hasty exodus from Egypt. The Haggadah, read during the Seder meal, instructs us to imagine that it is we who are leaving Egypt, with no time to properly bake bread, let alone assemble a multi-course meal. We eat matzah, the bread of affliction, as a reminder to put ourselves in our ancestors’ shoes. And while the holiday is not intended to be punitive, it offers the opportunity to practice restraint by refraining from certain foods for eight days. In most American cities, with only a tiny minority of people celebrating the holiday, the need to exercise restraint is continuous throughout the week. Jerusalem supermarkets sequester their non-kosher for Passover items, covering them with opaque cloths and clearly marking them as hametz, lest anyone err or be tempted. 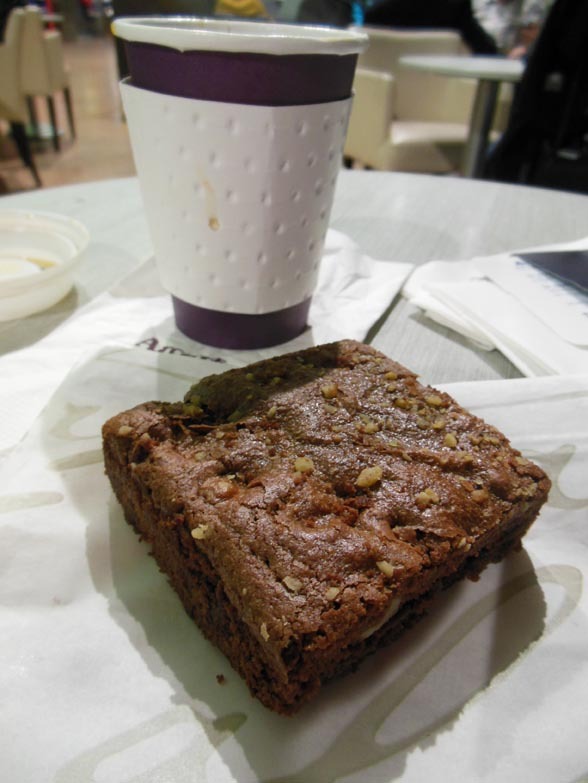 Before boarding my midnight flight at Ben Gurion Airport on the fourth evening of the holiday, I indulged in a Passover brownie at one of the terminal’s shiny cafes, where fresh faced baristas brewed espresso and cappuccino along with sandwiches on gluten-free bread. But it wasn’t until I landed in New York early the next morning, and checked into the Delta Sky Club for a nine hour layover, that I felt Passover’s familiar push-pull. Confronted with a bagel-laden breakfast buffet and lots of time on my hands, I was tempted to reach for one and rationalize the consumption. But I knew I’d regret yielding to the fleeting urge, whose intensity diminished once I checked in with my body and discovered I wasn’t that hungry. Had it been another day, I might have reflexively eaten one bagel, and then another, simply because they were available, ignoring my body’s signals. In this respect, the refraining practices of Passover offer the possibility of coming home to ourselves even as we recall the exodus.